As part of the TEMPEST (see my CEI web page, Wiki) protection requirements set forth by the NSA (Wiki) screen rooms should be monitored over time to be sure they still work. SKIFF rooms (Wiki) can be tested with a tester like this. For example if someone drills a hole in the wall that may greatly reduce the shielding effectiveness of the room. 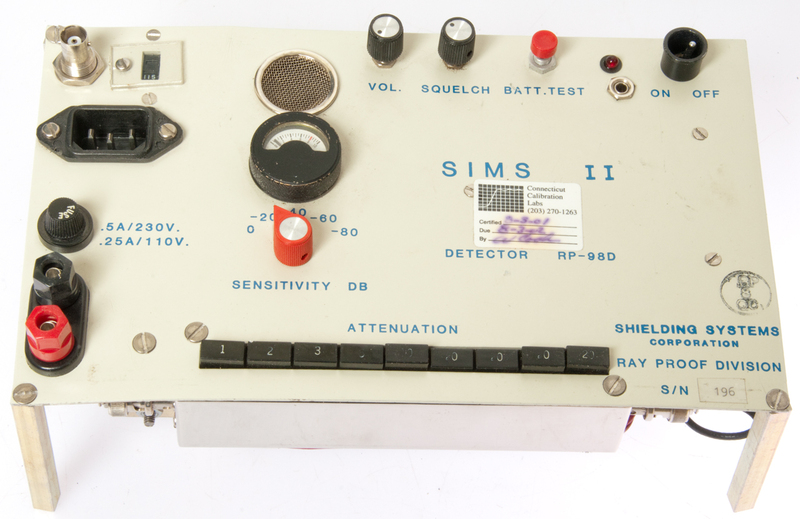 Rather than using a truck load of test instruments, these testers were developed to periodically check the shielding. Retlit Inc TS-45U, Euroshield 4F-130, Eaton Dorp Model 3500, and the Lindgen RF Shielding Integrity Monitor. 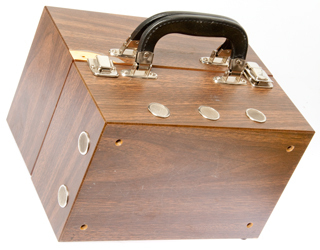 This set consists of a pair of boxes the clamp together so that they can be carried as a unit. (PS that photo at top was taken after the two electronics packages were removed, hence the empty holes that would otherwise show screw heads. The original maker might have been Shielding Systems Corp. 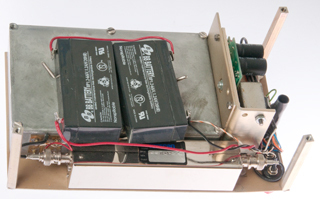 The receiver has a couple of 6V rechargeable batteries connected in series to provide 12 VDC. The leads were soldered to the batteries and they are so dead they no longer can be charged. One of the latches has broken off the wood case because it was attached with a couple of wood screws. It should have been attached using machine screws with a washer on the inside of the case. 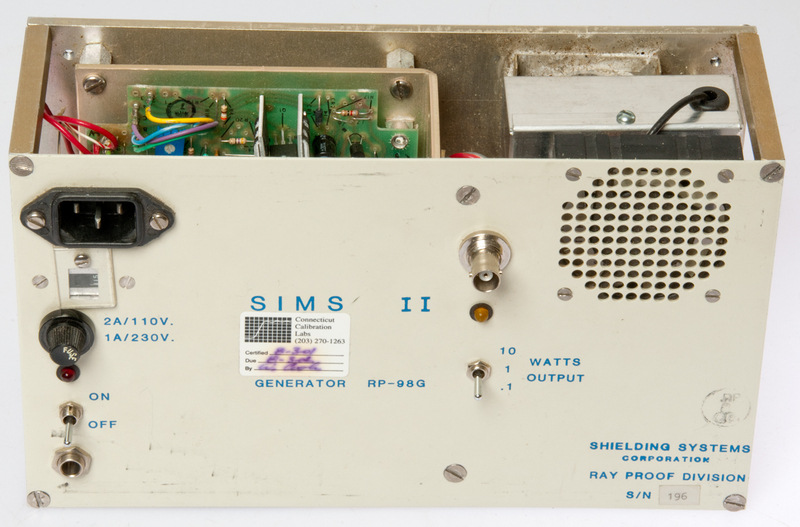 The RP 98G Generator is an AC line only powered transmitter at 462.6 MHz (a GMRS channel (Wiki)). The output is to a BNC-f panel connector. If the transmitter was used inside the screen room there should not be any RF power outside the room. The power level can be switched between 0.1, 1 and 10 Watts. The 1/4" phone jack is for a key or remote on/off switch. Since the Audio and Aux inputs to the transmitter module are not connected I think the output is just a CW carrier. The RP 98D Detector is a battery only powered receiver with a BNC-f panel connector. After the connector there is a Texscan 71 dB step attenuator with 9 in/out type buttons. In addition the receiver has a sensitivity switch with settings of: 0 (most sensitive), -20, -40, -60 & -80 dB. The dual Banana jacks are a relay output the closes with the signal strength meter is above some value to trip an alarm. Draws 82 ma at 12.0 V and 88 ma at 15.0 Volts. Feeding a signal from the HP 8648A into the receiver and pressing and releasing the 20 dB attenuator button shows a slight change in sound with the power level at -126 dBm. The frequency can be anywhere between 462.593 and 462.610 MHz. No modulation. The meter reading changes with both power supply voltage and RF signal level. With Battery Test held down the meter reads full scale (10) at 12.5 Volts and will go higher for higher voltages. The red mark on the meter at meter reading 8 corresponds to a power supply voltage of 9.38 and at this voltage 0.32 uV can just be heard. At 12.0 VDC and the sig gen at 1.99 Vrms you can still hear a signal with the sensitivity switch set at -80 and the attenuator at -80 dB. i.e. about 0.02 uVrms. In use a calibration is made between the transmitter and receiver (both using an external antenna) with the screen room door open and one of the RP98 units inside and the other outside. Then the door is closed and the receiver attenuator is changed to see how much shielding the room provides.